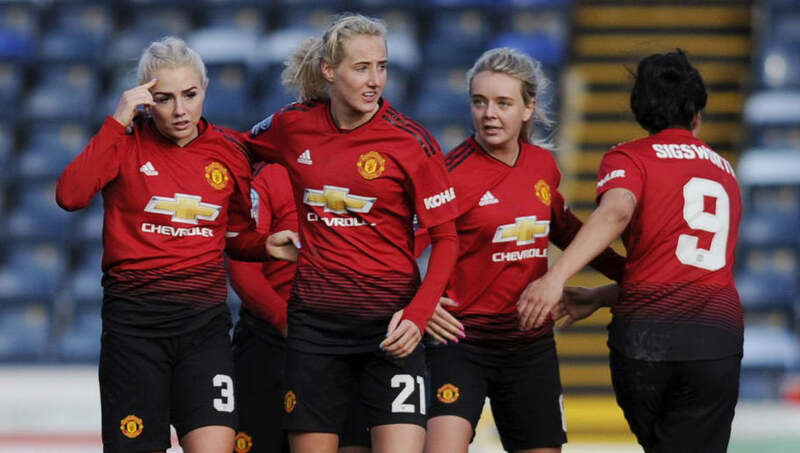 ​Manchester United and Tottenham Hotspur swapped places at the top of the Women's Championship table this weekend in what could prove to be a decisive moment in the title race. Pre-season title favourites United are now back on top after beating Charlton on the same day that Spurs lost ground in a surprise home defeat at the hands of Sheffield United. Sheffield United were in the headlines for the wrong reasons last week after forward Sophie Jones was hit with an FA ban after being deemed guilty of racially abuse of Spurs defender Renée Hector when the two teams met in the reverse fixture back in January. Making it plain that they do not condone such behaviour, the Blades terminated Jones' contract in light of the FA verdict and rallied to secure three valuable points in their first game since. Jessica Naz actually opened the scoring for Tottenham early in the second half, but Sheffield United struck back, equalising through Ebony Salmon. It was then a dramatic last-minute goal from Jade Pennock that won it for the visitors, who jumped into seventh place as a result. Spurs' defeat, only their third in the league this season, opened the door for Manchester United, whose 2-1 away win over Charlton put the early pacesetters back on top of the pile. After averaging 4.9 goals per game this season prior to kickoff, United weren't quite their usual free scoring selves. But a penalty from Katie Zelem shortly after half-time and a header from Jess Sigsworth proved enough for the win and three points, despite Kit Graham pulling one back for Charlton in the closing stages and making for a potentially nervous final few minutes. This fixture was a re-run of the one that had to be abandoned in January when Charlton defender Charlotte Kerr required lengthy on-field treatment after a penalty area collision. The fixtures involving United and Spurs were the only two played in the Women's Championship this weekend. United are now one point clear of their rivals and still hold a game in hand to potentially extend that lead to four points in due course. There are two automatic promotion places on offer into the top tier Women's Super League and United and Spurs look to have a comfortable grip on both of them, with the latter currently seven points clear of both Durham and Charlton in third and fourth place respectively. But while the top two are seemingly safe in the promotion race, the bragging rights for the title are still very much up for grabs and the clash between the pair at Tottenham's Cheshunt home next weekend promises to go a long way to deciding which team lifts the trophy in May. United won 4-1 in the reverse fixture back in November.